NEED TO RETURN GEMSTONES OR JEWELRY? At GemSelect, we strive for your satisfaction above all else! We offer a FULL 30-day money-back guarantee -- absolutely no transaction fees and no restocking fee deductions! In the rare event you wish to make a return for any reason, GemSelect makes it easy with our no-questions-asked policy. 1) Simply email us within 30 days of receiving your order for your return authorization number (RAN) and instructions. Write the RAN code under your name and return address on the outside of the package. 2) Send your return package back to us via your local post office, postmarked within 7 days of receiving your return authorization number. Please send your items back to us in original condition, inclusive of original packaging and gemstone certificates if applicable. For security reasons, do not write "gemstones" or "jewelry" anywhere on the package. We recommend returns be mailed via your local post office (USPS, Royal Mail, AU Post, Canada Post and etc). Local post services are very reliable and substantially cheaper than any express courier. 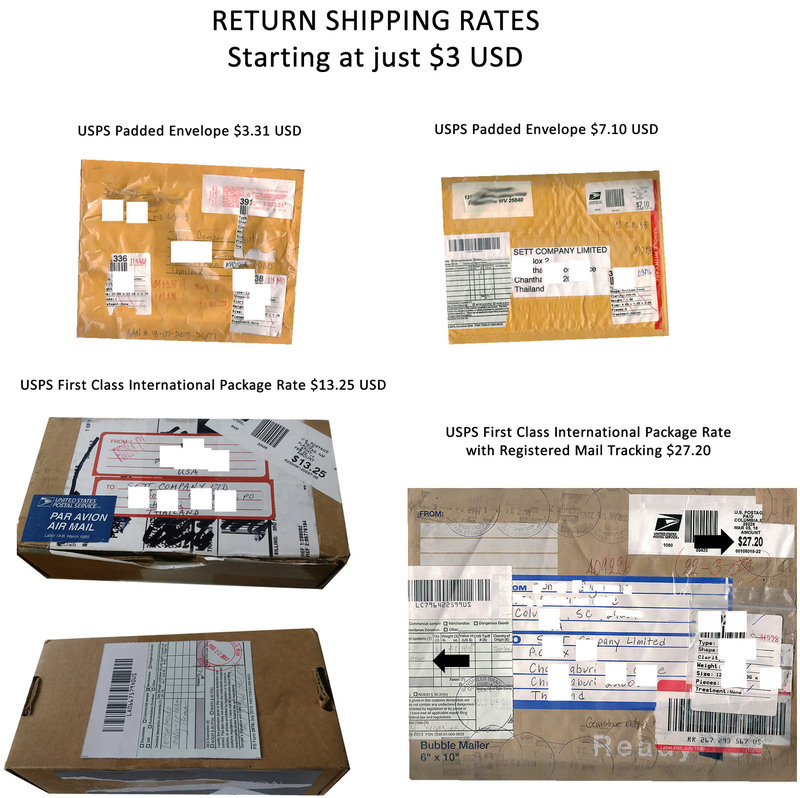 For orders over $200 USD, we recommend registered mail service, which includes tracking and is offered as an extra service available at every post office. After we have received your returned items and verified that your goods are in original condition, we process refunds within just 1-2 business days upon receipt of your return. GemSelect will refund the entire original purchase amount of the item via the same method of payment used in the original purchase, with the exception of SWIFT transfers and Western Union transfer. Orders paid by SWIFT and Western Union will have transfer fees deducted from the received amount (unless an error was made on our part), and the international exchange rate at time of purchase will affect the total amount received. For credit card refunds, in most cases, credits are made available within 2-3 business days, but please allow up to one billing cycle for the transaction to show on your statement. See more detailed information about our payment policy here. Unless an error was made on our part, return shipping expenses are the responsibility of the sender and original shipping fees are non-refundable. All sales are final after 30 days of delivery confirmation. RAN codes are valid for seven days from the date of issue and returns must be shipped during this period of time. If your authorization has expired, please contact us to request another RAN code. Should you wish to cancel an order after it has been shipped, please do not refuse postal delivery. If an order is refused, the customer shall bear responsibility for the full value of the items if lost, and all return shipping fees, brokerage charges and duties incurred upon its return will be deducted from the owed refund for the returned items. An additional 10% restocking fee will also apply to refused shipments. If the order has not yet been shipped, and you have not received a shipping confirmation email from us, please contact us right away with details of your order number and your request to cancel. Our customer support team will stop your shipment and refund your payment in full within one working day. In the event a parcel is received with damaged packaging, do not accept the package! Refuse delivery, make a report with the courier, and contact us immediately! If you have already signed for or received a damaged parcel, please do not open the package right away. Take several photos of the exterior and then send them to us by email at help@gemselect.com. This will allow us to assist you with either returning the items for exchange or refund, or we can help decide whether to open the parcel while providing evidence of the condition of the product/s. In most cases, the items are very well-packed and remain undamaged. We do allow 7-14 days' shipping times for most deliveries, as this is the typical delivery time-frame, but shipping times can vary for every country. If you do not receive your standard economy airmail order within 30 working days, please contact us, so that we can open a claim with the post office. Should the claim result in a confirmation of loss, we are more than happy to offer full refunds or replacement items if available. Claims take 7-14 days to process through local post offices as our post office must communicate with your post office. We insure all registered mail parcels for up to $200 USD. Please note that if your country is listed as one for which we allow 30-60 days, we cannot offer replacements or refunds until after 60 days have passed. Please see our international shipping page for more information. In many countries, declared shipments may be subject to customs fees and taxes. Buyers are responsible for any customs fees, taxes and duties owed. Returns made due to the aforementioned cannot be authorized. Please see our international shipping page to see if your country is affected by customs taxes or fees.